Below the following seven illustratons with shortish captions, is a “reprint” of this weeks now-then from Pacific Magazine, and a fine description by Jean of his visit with 90-year-old (and looking 77) Mercedes wonder-salesman Phil Smart on Capitol Hill’s Auto Row. 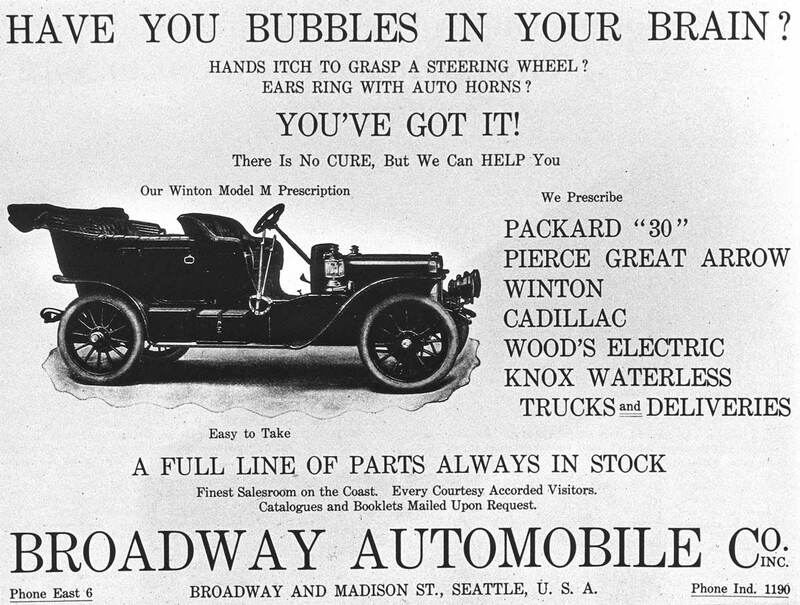 It was, as the above advert understands, one’s “itch to grasp a steering wheel” that turned Capitol Hill in to Seattle’s Auto row, and primarily on Pike Street and Broadway Avenue. 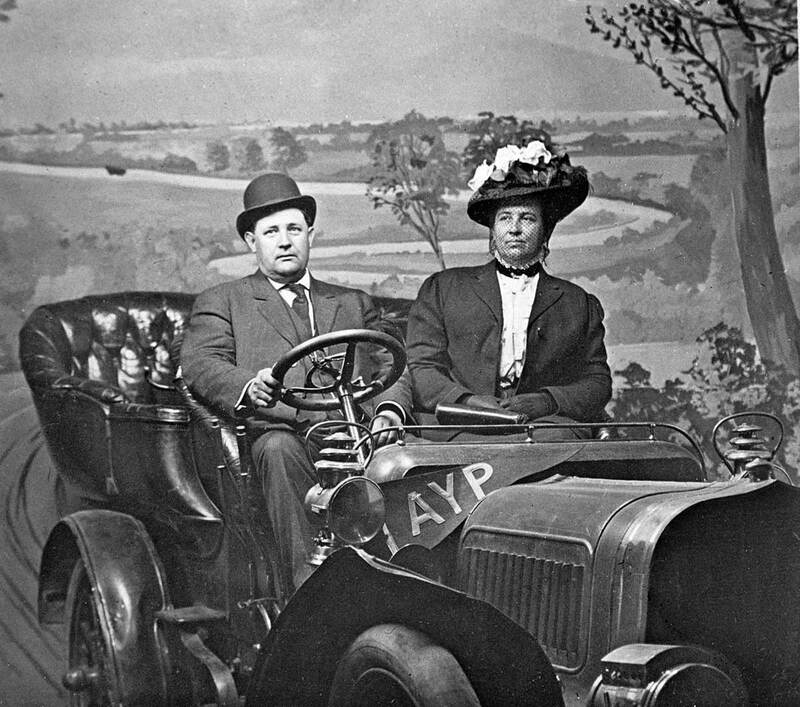 Still in 1909, the year of the primary now-then scene printed a few photos below, the best and cheapest way to grasp a steering wheel was to take your turn for a photo opportunity at the Alaska Yukon Pacific Expo that year. 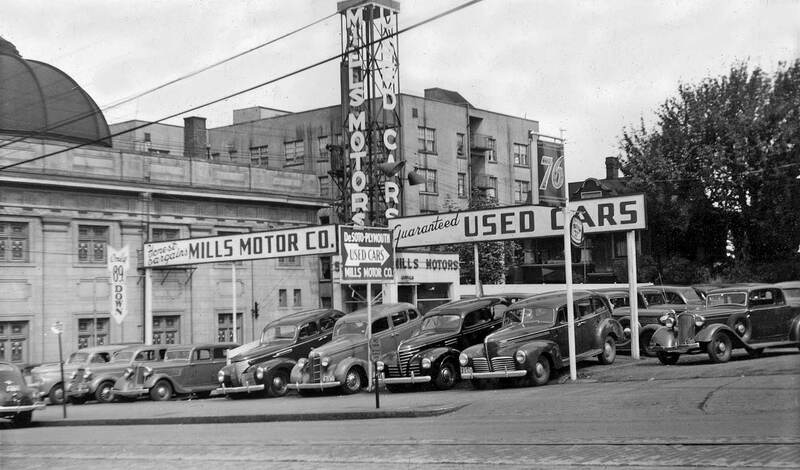 Here is more evidence of auto-heat on Pike Street, the Mills Motor’s used car lot between Summit and Crawford Pl. Street car tracks are still showing on Pike and that’s the Covenant Church on the left. 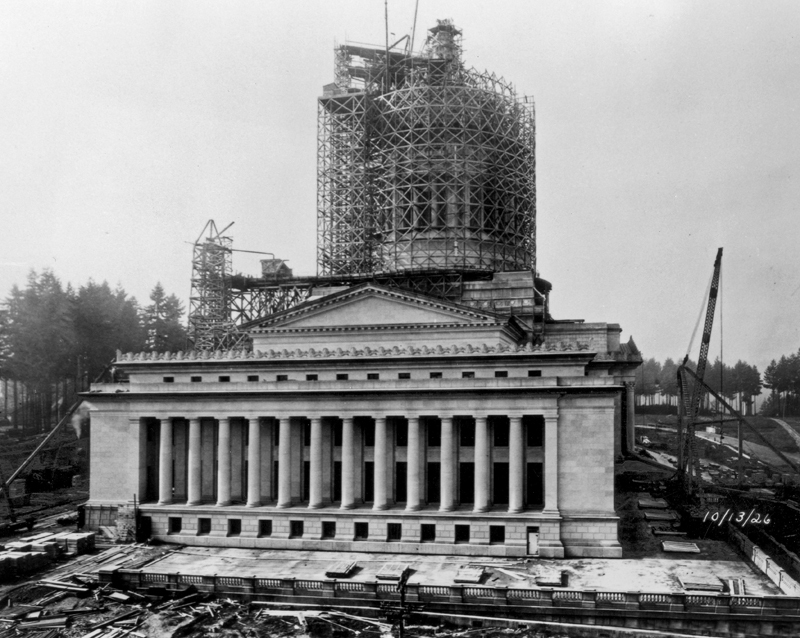 A glimpse into early 20th-Century Capitol Hill. 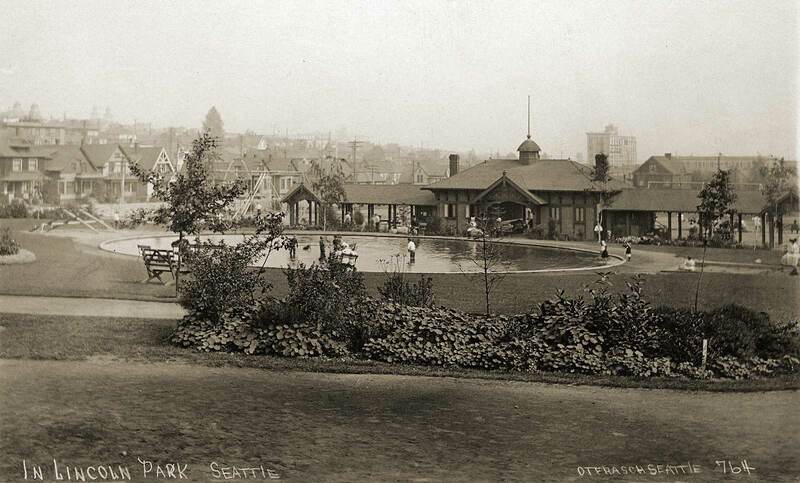 Here a Frasch photo titled Lincoln Park – but known better as Broadway Playfield – looks south towards Second Hill. Construction of the Providence Hospital tower is dimly evident on the horizon near the center. The new hospital was officially opened in 1912. The joys of dependable motoring were for many never more reliable than with the Dodge Dart. Dart was low priced and it kept on running. 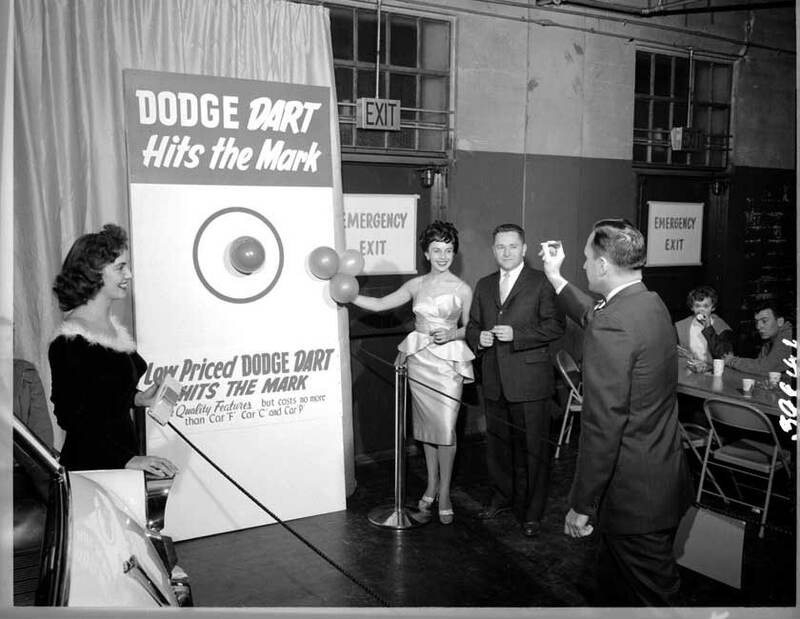 This promotional game was staged for long-time Seattle commercial photographer Roger Dudley. Thanks to Danny Eskenazi for sharing it. Not on Capitol Hill – or even about cars – but in the state’s capitol. 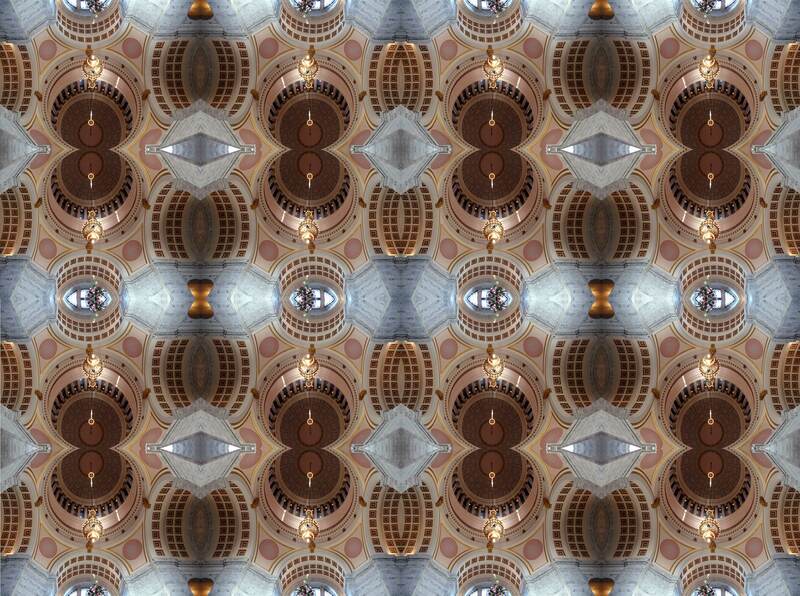 Here is one view of the rotunda-dome repeated 16 times – the Joys of Photoshop. The photograph from which this montage was constructed was recorded during our – Jean and my – visit to Olympia during Christmas season 2007 to help promote our book of state repeats, “Washington Then and Now.” The picture included directly below, and the last of the seven that prelude this week’s now-and-then on Pike Street’s Auto Row, is a 1926 construction scene of that same rotunda. This view and its repeat are included in the book just noted, which you can see in great detail on our webpage that is pretty much devoted to it: washingtonthenandnow.